PERIYAKULAM/ADIGAMA, Jan 5 2018 (IPS) – Last year was an annus horribilis for 52-year-old Newton Gunathileka. A paddy smallholder from Sri Lanka’s northwestern Puttalam District, 2017 saw Gunathileka abandon his two acres of paddy for the first time in over three and half decades, leaving his family almost destitute. The father of two had suffered two straight harvest losses and was over 1,300 dollars in the red when he decided to move out of his village and look for work in nearby towns. What am I to do? There is no work in our village, all the fields have dried up, everyone is moving out looking for work,” Gunathileka told IPS. He was left to work in construction sites and tobacco fields for a daily wage of about five dollars. When jobs became scarcer, his wife joined the search for casual work. The couple, who have been supporting their family off casual work for the last four months, is unsure whether they will ever return to farming despite the drought easing. Gunathileka is not alone. Disasters, manmade and natural, are increasingly forcing agriculture-based income earners, especially small farmers, out of their villages and into cities looking for work. In the village of Adigama, in the same district, government officials suspect that between 150 and 200 villagers, mainly youth, have left looking for work in the last two years. Sisira Kumara, the main government administrative officer in the village, said that the migration has been prompted by harvest losses. There was no substantial rain between October of 2016 and November 2017. Three harvests have been lost. Unlike in the past, now you cannot rely on rain patterns which in turn makes agriculture a very risky affair,” he said. In Sri Lanka, poverty, unemployment, lack of livelihood options and recurring climate shocks impact the food security of many families, resulting in migration to find secure livelihoods,” the International Organisation for Migration (IOM) said last year in a joint communiqué with the World Food Programme (WFP) and the UN Food and Agriculture Organisation to commemorate World Food Day. 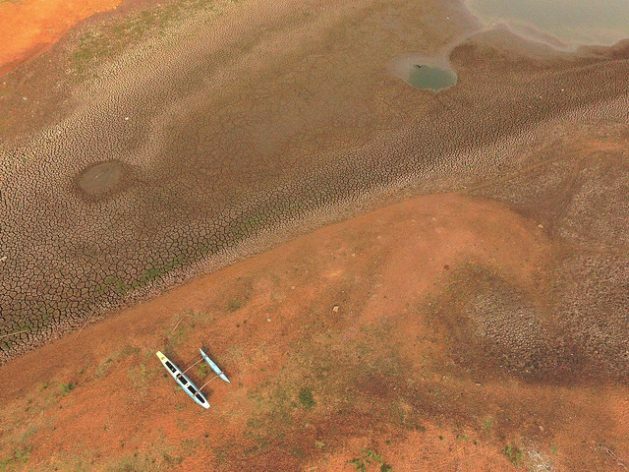 Climate shocks have been severe in Sri Lanka in the past few years. In 2017, a drought affected over two million people and floods impacted an additional 500,000. The vital paddy harvest was the lowest in over a decade, falling 40 percent compared to the year before. The UN has termed the 2017 drought as the worst in 40 years.. According to M.W, Weerakoon, additional secretary to the Ministry of Agriculture, paddy farmers have to work throughout the year just to stay above the poverty line. He estimates that a paddy farmer needs to cultivate 2.6 acres without a break just to make the 116 dollars (Rs 17,760) needed monthly for a family of four to remain above the poverty line. That is not possible with the unpredictable rains, so farmers are moving out,” he said. Around 20 percent of Sri Lanka’s population of 21million are internal migrants, according to government statistics, and experts like Weerakoon say that this movement is heightened by climate shocks. Staying in their native villages and continuing to farm pushes victims further into a debt trap. Last August, when the drought was at its peak, a WFP survey found that the family debt of those surveyed had risen by 50 percent compared to a year back. And as formal lenders like banks shy away from lending to them, these farmers tend to seek the help of informal lenders. Human-made disasters are also pushing the poor out of their homes to seek jobs elsewhere. 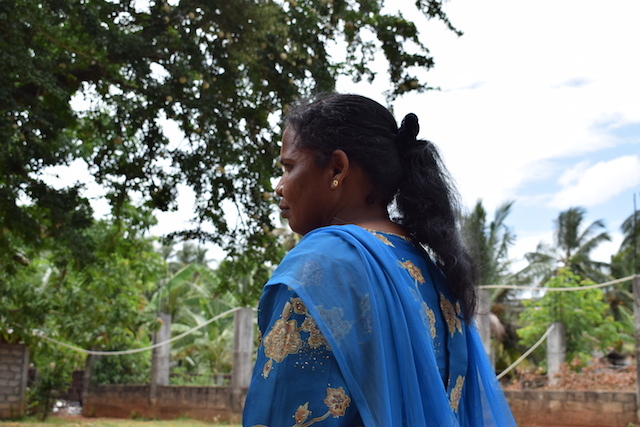 In Sri Lanka’s North and East, ravaged by a deadly civil war till 2009, high poverty rates are forcing vulnerable segments of society like war widows to seek work elsewhere. In the Northern Province where the war was at its worst, female unemployment rates are almost twice the national rate of 7 percent, at 13.8 percent. There is no data available for single female-headed households of which there are at least 58,000 out of the provincial total of 250,000. Last year, the Association for Friendship and Love (AFRIEL), a civic group based in the province, located 15 women stuck in Muscat, Oman, after being sent there by job agents. At least four were from the war zone and none had been paid for months and were being moved around the Omani capital daily working in odd jobs. Nathkulasinham Nesemalhar a 54-year-old war widow who was part of the group, said that they were being sent for casual work by the job agents to recoup costs. All of us could not work in the households due to various issues, so for three months we kept doing odd jobs, so that the agents made their money,” she said. The group was finally brought back to Sri Lanka after the government intervened. Unfortunately, there have been few such interventions since the war’s conclusion. The IOM office in Colombo said that climate-driven migration was fueled by complex and diverse set of drivers and required multi-dimensional risk assessments and interventions. Government official Weerakoon said that one of the main ambitions of the government in 2018 was to increase the planted extent of paddy and other crops. The government also plans to introduce measures to increase value addition among farmers who remain by and large bulk suppliers of raw produce. This entry was posted on Thursday, January 18th, 2018. You can follow any responses to this entry through the RSS 2.0 feed. You can skip to the end and leave a response.